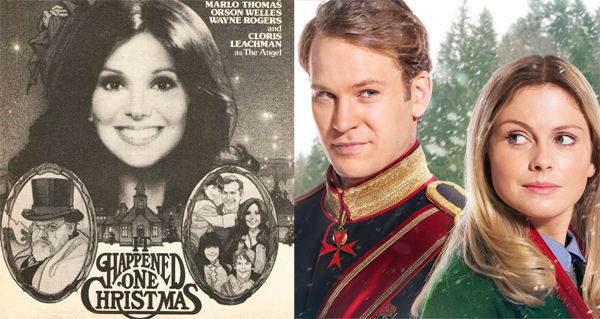 Critically Acclaimed: Canceled Too Soon and Linoleum Knife: "It Happened One Christmas" and "A Christmas Prince"
Canceled Too Soon and Linoleum Knife: "It Happened One Christmas" and "A Christmas Prince"
It's Christmas in July! This year, our very own Canceled Too Soon podcast is teaming up with the amazing folks at Linoleum Knife to review two cult Christmas TV movies, one you've heard of and one you might not even believe is real. Here at Canceled Too Soon, William Bibbiani and Witney Seibold invite Dave White and Alonso Duralde to review "It Happened One Christmas," a 1977 television remake of "It's a Wonderful Life," starring Marlo Thomas ("That Girl") in the James Stewart role, Cloris Leachman as the angel, and Orson Welles as the dastardly Mr. Potter. It's one of the weirder footnotes in Christmas TV movie history! Listen to the "It Happened One Christmas" episode now! Over at Linoleum Knife, Dave White and Alonso Duralde invite Bibbs and Witney over to review Netflix's unexpected cult hit "A Christmas Prince," starring Rose McIver ("iZombie"), Ben Lamb ("The White Queen"), Sarah Douglas ("Superman II") and Alice Krige ("Star Trek: First Contact"). It's one of many TV movies about American girls falling in love with fictional European princes, and surprise! Almost all of them are directed by the same guy. Listen to the "A Christmas Prince" episode now! These episodes are PATREON EXCLUSIVE, so to listen to both of them you'll have to subscribe to both Canceled Too Soon and Linoleum Knife. But you'll be glad you did! They both have fantastic content! A Christmas Prince was, indeed, abysmal. The worst part for me, which you didn't mention, is how the little sister is completely ignored in the third act. While this is irritating in and of itself, she actually had a linchpin plot point to play out, which they totally ignored. She KNEW Rose McIver was a reporter and had ASKED HER to write the "true" story of her brother. When pooh hit the fan, where was she? She had a big reveal ready and waiting, which could have turned this into a completely different, and much better, ending. There were other points raised then ignored, but this was the one that disappointed me the most.